I get it, you are busy. You don’t have time to build excellent business systems because you are giving all your time to building your business. Do you know you already have many of these systems already in place and you don’t even realize it? Keep reading and I’ll explain. We are all creatures of habit. Every morning you get up, you use a system. It’s what you usually do when you get out of bed. I get up, grab a glass of water, visit the bathroom and look at what my day is. I’m not a breakfast eater, and I had to devise a system so I do eat breakfast (most important meal of the day etc). I have systems in place for getting clothes ready, how I like to shower, brush my teeth and everything else I need to do to be ready to start my day. Throughout my whole day, I do things a certain way, from how I make coffee, check my phone and emails, eat meals and go to bed. Each one of these is a habit I do without even thinking, every single day. Your business habits are exactly the same. You have a way of doing your calls, customer service, quotes, customer service, replying to emails, booking calls, and the list goes on. “Your way of doing” is your business system. Your systems decide what, how and when jobs are done in your business. When you are the only person working on your business, keeping all your systems in your head can work fine, as long as you have a great memory. If you don’t, consider making some systems that help you get everything done. Phew, that’s a lot of things to remember. Some of these tasks are easy to remember as you do them every day. However, have you ever forgotten to do something you do every day? I have, and just totally forgot about it. I’ve even started it, something came up and my mind was tricked into thinking I had finished it. It’s not until the next day that you find out, oops, didn’t do that. If you forget things you do every day, so how easy is it to forget all your other tasks. It’s really easy for me, as I have a rotten memory until I remember. To protect my business, and myself, I build excellent business systems. I want systems I set up once, and know they will keep on working for my business. How you set up your systems has to work for you. I am going to recommend things that can help you to start building your systems, so take what works for you, or use my ideas to find what will work for you. These are simple solutions that don’t take up a lot of your time. Remember how we talked about in the beginning that you don’t have time to build systems? You don’t but you do, so let me explain. A small amount of time spent every day can build up your system to do one thing. You are already doing it, and you take a minute to start your system so instead of spending hours in one day, you can spend minutes every day until your system is finished. Then you can start on the next one. Start with a new business habit and record what you do in a day. Write down or record as you do it, and use any of the following. On a piece of paper, a google or word doc open, Evernote, an email, recording, back of an envelope or in a journal whatever works for you. You need to record it, on something you can find later to look at. As you think of something, add it to the list. If it’s something you have to do next month, record it like this – Taxes – November. This is the quickest way of building your list of systems you need. You don’t need to add in everything you do for that task, especially if you are the only one in your business right now. You just need the list. Add to it over a week. If the envelope gets filled up, store it where you can find it and use another. You aren’t going to do anything other than record what do you do. If you try to do more, you will stop doing it. Keep it Simple Systems is what you are doing. It is better if you can record it where you can access it later, like google or word docs, Evernote or in an email, as you can copy and paste it, however, if it’s an issue to type it, do what work for you. Remember, this is about building your systems the way that you need it. If you have no problems with daily tasks, start writing down any long-term systems you need to keep a track of. Start recording what has to be done every year and when and what to do each quarter or month. Your business system always has to save you time, so find the first task a system can help you with. Look over your list and see the main job you have trouble with. Do you forget to send out a weekly newsletter, is there a monthly accounting task you need to do, have you checked your quarterly reports? Everyone’s list will be different. Try and find something that’s due soon, as you want to see a result for setting up your first system. If your taxes are due in 11 months, and your accountant is chasing you for receipts this month, do the work your accountant needs first and set up your system. If you are forgetting to do something, it’s usually for a few reasons. You hate it, can’t do it, it’s difficult, time-consuming, boring, or you don’t think it’s important. There can be a lot of other reasons, but I find these are usually the main reasons. You don’t have to tell me the reason, just work it out in your own mind. Why do you forget or don’t do this task? Next question has to be, does your business need it? This can be a fun exercise when you realize you don’t need to do it and get rid of it. Most of the time, you do need to do it. This is where setting up your first system will help you and your business. You had to do it before, so you know what to do. Find what you did the last time and refresh your memory. Write down the major steps, record a video so you can look at it next time, or find something via Google or YouTube that shows you how to do it. You don’t have to invent the wheel, so find what will help you build your system. Now you know what the task is, write down the major steps, record a video to look at next time, find something via Google or YouTube that shows you how to do it. You don’t have to invent the wheel, it’s making your system work for you. Use a calendar system to help you to remember your system. If you use Google calendar, create a Business Calendar and you can do something similar with Outlook. Use a paper calendar, if it works for you. Spend a few minutes setting it up, and it’s done, you have a reminder to do the job when it needs to be done. Add in when tasks are due and add in the steps, links, videos etc that will let you know how to do it next time. Have it remind you to start the job when it’s due. If your accountant needs all your receipts by the end of the month, set up a reminder a few days before to start gathering them. If you have to send out a newsletter every week, add the reminder in. Your final task is to test it. Do the task and find out if it has all the information needed to get it done properly and on time. Did you record all the main steps? Was there enough time to complete the task? Did you get the result you wanted? If you answer no to any of these, then you need to make changes. If the answer is yes, then congratulations, your first system is completed. Now you can look at the next one, and the next and the next. As each system is built, your business is stronger as everyone can do the job. As your business grows, you can give these systems to your employees, or virtual assistants and know the system works. Building Excellent Business Systems will save your business time and money. You can be confident that tasks will be done on time, your way and the right way. As your business grows, hiring an employee or assistant won’t be as stressful. Your systems can be handed to them to now look after, whilst you work on what allows your business to grow. If you want to know more about building systems, check out this training. Find out how you can record your Skype call with Evaer for your client and have it work every time. Stop worrying about your recording software letting you down by failing or not making a great recording. Keep reading to find out how to record your Skype calls with Evaer and get a good recording of your call. I started looking for a product to use with Skype to make sure I was always able to offer my clients a good recording of our call. I had tried Camtasia and it would sometimes have it fail or suffer an error whilst waiting for it to produce the video. I tried Audacity and had some problems with my soundcard. Audacity is a great program, however I had conflicts with some of my audio hardware. Making sure it worked every time was becoming a pain. 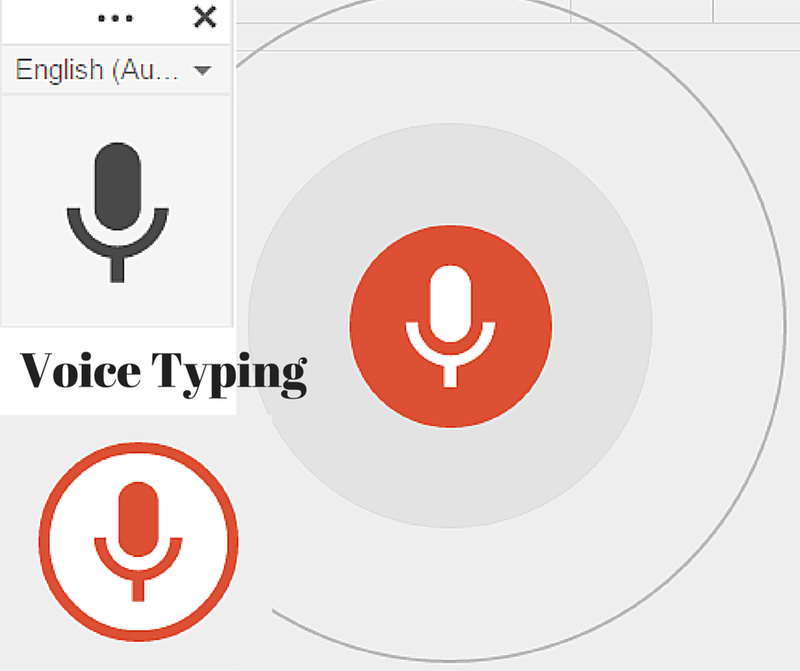 I just found this great little tool called Voice Typing that’s available in Google Chrome using Google Docs. I can actually talk and Google docs will record what I say. if you are someone who finds it hard to type, being able to sit down and speak as you are working out what you want to say will help get your writing done. So how does voice typing work? You must have Google Chrome and access it via Google Docs. Then go to tools, and choose Voice Typing. It’s not as powerful as Dagon Naturally Speaking but it is free. Occasionally you miss saying some punctuation because you have to say the words comma, and full stop immediately after you have said the word. Sometimes you can speak quite fast using voice typing and if you’re a slow typist, this may be exactly what you need to be able to start typing up your posts, email sequences or even your newsletters. Don’t stress out if you’ve used punctuation and voice typing has missed putting in what you need. One of the biggest issues people have, is that they stop while they’re writing to try and tidy up their posts. I’m a very fast typist and type it about 120 words a minute and as a best practice, it’s much easier to edit after you’ve done your typing then to do it while you are typing. The reason for that is you stop the flow of your thoughts to put in a heading or bold a word or any of those sorts of formatting, make it pretty things on your document and you stop typing. Voice typing is great for anybody wanting to learn this practice because you just type and then later on you can go back and do all the punctuation and pretty things (formatting). If you make a mistake and you have put in the words full stop or paragraph, you can easily fix it by using find and replace under the edit menu or Ctrl H.
I’ve typed this entire document using voice typing. I’m going to put at the bottom of this post what it actually looks like before I did the editing and I’m also going to record a video showing you how to fix all of this up. if you’re somebody who find typing hard to do, I think you should give voice typing a try and see if it works for you. You do have to be in a quiet place, though I’ve had the program saying that it’s having trouble hearing me but it still recording just about everything ok.
I’ve also used it so far on my PC and on my tablet. so give it a go and see what you think of voice typing. Recording recording it saying it as I’m speaking to you you could say hi I’m Tania Shipman from simple solutions today and I’m here today to tell you about Google Docs voice typing. I just found this great little tool that’s available in Google Chrome using Google Docs. So how does voice typing work you must have Google Chrome and you access it via Google Docs go to tools, and choose voice typing. Don’t stress out if you’ve used punctuation and voice typing has missed putting in what you need one of the biggest issues people have is that they don’t is at a stop while they’re writing to try and tidy up their posts I’m a very fast typist I type it about 120 words a minute and as a best practice it’s much easier to edit than it is to it’s much easier to edit after you’ve done your typing then to do it while your why you are typing the reason for that is that you stop the flow of your thoughts to put in a heading or to bold word or to do any of those sorts of make it pretty things on your document so anyway voice typing is great for anybody wanted to learn this practice because you just type and then later on you go back in and do all the punctuation and pretty things. If you make a mistake and you have put in the words. Or paragraph you can easily fix it up by using find and replace Under the edit menu or ctrl h.
Now to me, it was obvious – it was a mail-merge question, using Word and a database (I always use Excel) to create labels. For my friend, it wasn’t obvious at all. He had never heard of the term and not knowing what it was, couldn’t search on Google to find the answer. If you type in his question into Google, none of the top 10 results even mention mail-merge. So he didn’t know the right question to ask, had no idea of the possible solution and until he found an answer, the only solution was hand writing / typing up 500+ labels or copying from each cell in his excel sheet into a label. My friend was smart, he knew he didn’t know, so he asked. I was the first one to answer, however others also knew the term and if I hadn’t answered, someone else would have helped. He got a solution to the issue he had. How many times in your business have you been frustrated or stuck on something because the only way forward looked like it would take a long time or the job was just too hard. This is exactly the time you need to stop what you are doing and ask if there is any other way to do what you need done. You might think the way you are doing it is the only way, however still ask. It might be the only way because it just is…, and what you find out is a tip that lets you do it in 15 minutes instead of 2 hours. There may be multiple ways of doing it and you can get recommendations on what everyone likes. I’ve seen multiple Facebook, Skype and Blog posts where someone asks a question, find out what they didn’t know they didn’t know and then more people comment saying OMG, I never knew that. I’m just as guilty as all of you, not knowing what I don’t know. I’ve had friends, colleagues, VA’s and staff ask me “Why do you do it that way” and find out something new. If you want more of these Simple Solutions posts, let me know your questions below as a comment and I’ll do my best to answer them in upcoming posts. Some of my areas of expertise are outsourcing, management, leadership and office skills (tips, systems, etc to save you time and gain efficiency). So your challenge is, give me a question and see if you can stump me… which I doubt. The good news is you will get some valuable information and see how I solve difficult problems for my clients.